Unique microscopic structures make the feathers so black they look like a hole in space around the colored patches. The male superb bird of paradise shows his super black feathers to a brown female. (Inside Science) – In the rainforests of Indonesia and Papua New Guinea, the male superb bird of paradise puts on a show to impress the ladies. He calls to attract attention, then lifts his feathers to form an intensely black oval streaked with flashy teal. The black feathers are so dark that the head of the bird disappears into their velvety depths, his display becoming an abstract painting. Now scientists have uncovered why the feathers look so profoundly black. When the researchers examined the plumage of multiple birds of paradise species, they found the super-black feathers sport microscopic bush-like structures, with some dimensions thinner than a human hair. “Depending on the bird, some look like a bottlebrush, a miniature coral reef, or a tree with long, narrow, tightly packed leaves,” wrote Cody McCoy, a biologist at Harvard University, in an email. McCoy is one of four authors on a paper describing the feathers, published today in the journal Nature Communications. The tiny structures form mini “light traps” that bounce light around until most of it is absorbed. The darkest bird feathers absorbed 99.95 percent of light that fell directly on them. Other animals, including snakes and butterflies, use the same optical technique -- called structural absorption -- although the material and shape of the light traps vary. Human engineers have also gotten in on the game. An art installation at the upcoming Winter Olympics in South Korea will incorporate an ultra-black material called Vantablack, which uses carbon nanotubes to trap light. 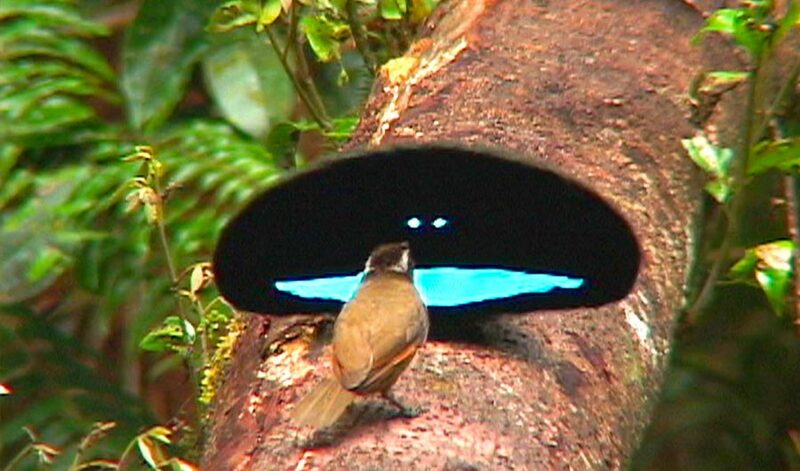 The birds of paradise appear most black when viewed from straight ahead, and the males often hop around to make sure the females see them from this angle. The researchers hypothesize that the super-black patches evolved as an optical illusion to make males’ brilliant colors appear even brighter and more appealing to female birds.